The prospects look good that wheel hub motors will successfully become the accepted drive concept for electric vehicles. German researchers are engineering these motors, which are integrated into the car's wheels. In order to make electric cars a part of everyday life, new vehicle designs and parts are needed. Take wheel hub motors, for instance. One of the advantages of wheel hub motors is that manufacturers can dispense with the conventional engine bay - the space under the "hood" or "bonnet" - since the motors are attached directly to the wheels of the vehicle. This opens up a wealth of opportunities for car designers when drafting the layout of the vehicle. Additional advantages: By dispensing with the transmission and differential, the mechanical transmission elements suffer no losses or wear and tear. Moreover, the direct drive on each individual wheel may improve the drive dynamic and drive safety. Researchers are developing not only individual components, but the total system as well. They assemble the components on their concept car, known as the "Frecc0" or the "Fraunhofer E-Concept Car Type 0" - a scientific test platform. Starting next year, automobile manufacturers and suppliers will also be able to use the "Frecc0" for testing new components. The basis of this demo model is an existing car: The new Artega GT manufactured by Artega Automobil GmbH. The establishment of this platform and the engineering of the wheel hub motor are just two projects among the panoply run by "Fraunhofer System Research for Electromobility". The research cooperative is focusing on subjects that include vehicle design, energy production, distribution and implementation, energy storage techniques, technical system integration and sociopolitical matters. The federal ministry for education and research BMBF is funding this Fraunhofer initiative with 44 million euro. The goal is to develop prototypes for hybrid and electric vehicles, in order to support the German automotive industry as it makes the crossover to electromobility. Wheel hub motors were invented back in the 19th century. Ferdinand Porsche used these motors to equip his "Lohner Porsche" at the 1900 World Fair in Paris. Much has been done since then: "We are developing a wheel hub motor that integrates all essential electric and electronic components, especially the power electronics and electronic control systems, into the installation space of the motor. Thus, no external electronics are necessary and the number and scope of the feed lines can be minimized. There is a marked increase in power compared to the wheel hub motors currently available on the market. Moreover, there is an innovative security and redundancy concept, which guarantees drive safety - even if the system breaks down," explains Professor Matthias Busse, head of the Fraunhofer Institute for Manufacturing Engineering and Applied Materials Research IFAM. Beside IFAM, researchers from the Fraunhofer Institute for Integrated Systems and Device Technology IISB, for Mechanics of Materials IWM and for Structural Durability and System Reliability LBF are tackling these issues. Critics find fault with the negative effects of wheel hub motors on vehicle handling. Dr. Hermann Pleteit, IFM project manager, responds: "The motor is extremely compact. The high power and torque densities merely cause a relatively low increase in unsprung mass. But by configuring the chassis in different ways - like the muffler settings, for example - you can compensate for these effects. There is no impact on drive comfort." The researchers are meeting yet another challenge: In contrast to conventional vehicles, electric cars can recapture the energy that comes from braking, and feed it back into the battery. In this case, the experts refer to "recuperation". Now they are working on maximizing this energy recapture in the future. The conventional braking system still in use will only be needed in emergency situations. 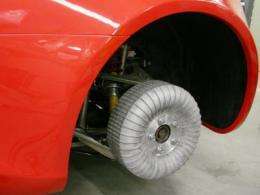 With the Fraunhofer wheel hub motor, the researchers are implementing Ferdinand Porsche's idea for the cars of the future, and testing these components on the demonstration vehicle. This must greatly increase the efficiency of the car since you are not losing energy due to friction in the transmission and drive train as well as reduced weight in the vehicle. I would love it if these could be designed into a hybrid retrofit for the rear wheels of cars with front-wheel-drive gasoline engines.